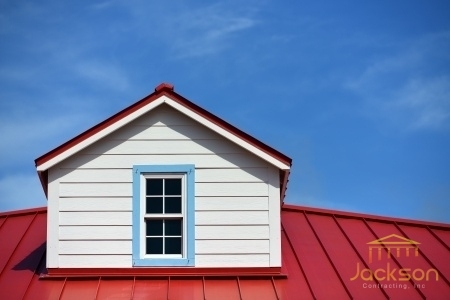 The Benefits of Metal Roofing for Your Home - Jackson Contracting Inc.
Metal roofing for homes has become more and more popular over the years. There Are Many Benefits of Metal Roofing for Your Home. What used to only be utilized by industrial buildings and barn structures, has turned into a great roofing system for residential properties, and with good reason. Metal roofing has many benefits that make them such a great residential roof options. Below are the benefits of metal roofing for your home. From standing seam metal to copper, homeowners have quite a selection of metal roofing materials to choose from. All of them have their unique look and characteristics, so it really depends on what aesthetic and protection you are looking for. There are a number of reasons that metal roofs are environmentally friendly. One, they are a recyclable material. Two, they can be installed directly onto your current roofing system. Three, they are great insulators, so you are saving money on heating and cooling costs. Because metal roofing is beautiful and they are long-lasting, with a lifespan of 30 to 50 years. Since they are stunning roofs and add extra safety to your home, it ends up adding more value to your property. Another thing to think about if you consider reselling your home down the road is the look of your home. Having a beautiful home will catch the attention of homebuyers, and a great eye-catching detail is a nice roof. a metal roof is a great way to boost your curb appeal. The benefits of metal roofing are many and they will definitely bring you a number of advantages. If you are interested in a metal roof for your Indianapolis, IN home, call Jackson Contracting, Inc. today at 317-214-8124.